One of the pillars of the cell theory is that there is no spontaneous generation but a new cell arises from another pre-existing one. Although images of dividing cells had been observed practically since the beginning of the use of the microscope, it took time to realize that those images were really a process of forming new cells. It took even longer to accept that the new generation of cells was due to a cell division by binary fission, that is, an initial cell divides into two descendant cells. It was not until the beginning of the eighteenth century that scientists began to worry about how cells originated. By the mid-nineteenth century, some researchers began to propose the appearance of new cells by binary division, but this idea had to compete with others already established. Theories about the generation of new cells can be divided into three: exogeny, endogeny and division. The exogeny suggests that new cells arise from other pre-existing ones, the endogeny that new cells arise within another pre-existing ones and the division suggests that new cells appear by binary division of pre-existing ones. This theory proposes that the formation of new cells occurs outside the cells themselves, and several versions are found. The exogeny by partition says that the appearance of new cells is by division of the space that exists between them through the creation of septa or separating walls. This idea was suggested by Link in 1807 (Fig. 1). Another version describes exogeny by vacuolization, according to which the first thing that happens is the formation of a series of vacuoles in the extracellular space that are fused together to form a functional cell. Wolf proposed this theory in 1759. 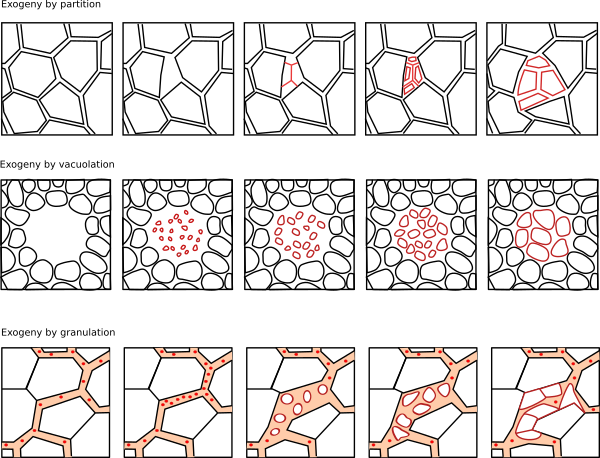 Another variant, proposed by Sprengel in 1802 but even defended by Schwan 30 years later, is the exogeny by granulation, according to which there are granules in the intercellular spaces that merge and grow until forming a new cell. Different versions of the theory of exogeny to explain cell division (modified from Barker, 1953). The first version of this theory propose that new cells originate from internal granules in the mother cell that travel to the periphery, go out of the cell and by growth originate a new cell. It emerged around 1810 and was described by Treviranus. A second version suggested that the granules did not actually leave the cell in which they had formed, but that two of them grew inside the cell until they become so large that ended up as independent cells, while the mother cell disappeared. Sprengel described this version in 1802. In fact, the granules were granules of starch, which at that time were not known as such. This theory was widely disseminated in the following years and was supported by Raspail and Turpin. Raspail thought that within each granule there were others smaller and so on, in the way of Russian dolls. This would produce an almost infinite progeny for each cell. Schleiden, formulator of the cell theory, also supported endogeny in certain cases. Different versions of the theory of endogeny to explain cell division (modified from Barker, 1953). In the middle of the nineteenth century, there was a major change in the way of thinking about the appearance of new cells. In 1849, Virchow writes "the cell, as the simplest form of manifestation of life that in spite of it represents the idea of life, is the organic unit, the indivisible living unit"
Different versions of the theory of cell division by partition (modified from Barker, 1953). One of the main problems in recognizing cell division by bipartition was that initially the focus was on the cell wall. If the cell wall was divided, so was the cell, but if that did not happen there was no cell division. Four theories by which new cells appeared by cell division were established: by partition, by constriction, by cell division and formation of new cells with cell walls, and by cell division without cell walls. The confluence of studies that led to the general belief that the new cells arose by division of a pre-existing cell in two or more parts arose from the observation of protists (unicellular organisms), filamentous algae and segmentation of the zygotes of certain animal species. Leeuwenhoek already saw pairs of protists and interpreted them as images of matings. The first image of cell division dates from 1704 and was interpreted as a mating process. The first one that really described the cell division in detail was Trembley in 1744 in vortexes. His detailed descriptions later helped other authors to interpret cell division. He also described the division of diatoms in 1766. However, this author did not describe the process as a cell division but as an organism division. The first to realize that the division of microorganisms was actually a cell division was Morren in 1830. Later, Ehrenberg and Nägeli described other divisions of unicellular organisms. B. Dumortier (1832) describes the binary division in plant cells. He detailed the appearance of the wall between the new cells and proposed that this is the mechanism of cell proliferation, which led him to reject other theories that existed at that time, such as those proposing that cells were created inside other cells as Russian dolls, or that they appeared spontaneously. Mohl (1837) described in detail the formation of new cells in this type of algae and said that they appeared by bipartition. In 1938, Meyen called this process division by partition. The observation of the division of large zygotes like those of frogs helped to see cell division as a phenomenon of division by bipartition. Paradoxically the most difficult for researchers was to realize that blastomeres, cells of the embryo, were actually cells. von Baer (1834) was the first to realize that the grooves that appeared in the blastomeres were complete division planes that divided cells into smaller ones. Barry (1839) and Reichert (1840) were the first, independently, to say that blastomeres were individual cells, but it was Bergmann of Göttingen (1841) who joined the two concepts: plane of division of blastomeres and that blastomeres were cells, studying amphibians embryos. This idea was spreading in the following years and numerous scientists that proposed different theories were reinterpreting their own observations. Numerous works published in other animal and plant cell types highlight those of Nägeli in plants and were accommodating to this idea of division by bipartition. It remained to be established that this process was universal, that is, that all the existing cells multiplied by bipartition. Although we owe the sentence "Ommnis celulla e cellula" to Raspail, it was Remak and Virchow who said it with all the foundation that has survived to our days. In 1852, Remak maintained that cell division was the standard method of formation of new cells, of any cell. Virchow came to the same conclusion in a publication of the same year and wrote the famous sentence, probably read from Leydig, who had also written it for another purpose. Virchow defended vehemently that spontaneous generation did not exist and that wherever there was a cell, previously there must have been another. The initial work to mechanically describe cell division occurred around 1870. 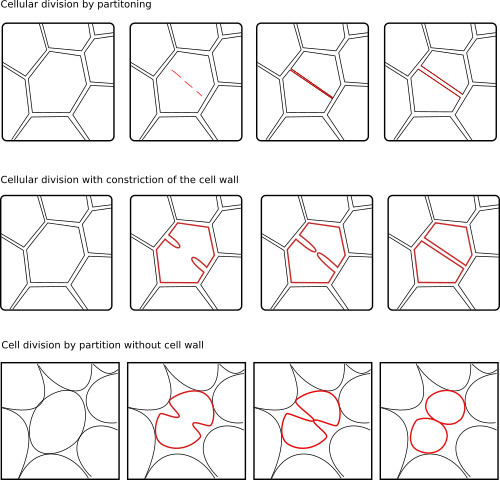 F. Schneider, E. Strasburger and others described the different organization of chromosomes during cell division. E. van Veneden even observed darker structures at the ends of the mitotic spindle that we now call centrosomes. W. Flemming was the person that best described the movements and organization of chromosomes and proposed the name of mitosis. The increase of observations and breakthrough in the knowledge of cell division was largely due to the improved quality of microscopes. Achromatic lenses appeared around 1823, lenses with large numerical apertures in 1875 and immersion lenses in 1878. The latter led microscopes at their highest resolution power: 0,2 µm. The images obtained with fixed material, in which the fibers of the mitotic spindle could be seen, initially were not considered as real because they were not observed in living material and were, thus, considered artefacts of the technique. Weismann (1885) proposed that the genetic information was in the chromosomes. Baker, JR. The cell-theory: a restatment, history, and critique. Part IV. The multiplication of cells Biological. Journal of microspical science. 1953. 4:407-440.